The Chanel Fall-Winter 2014/15 Ready-to-Wear runway show last year caught me completely off-guard. Compared to the brand's typical decorated runway, the supermarché theme was so fun and entirely unique. 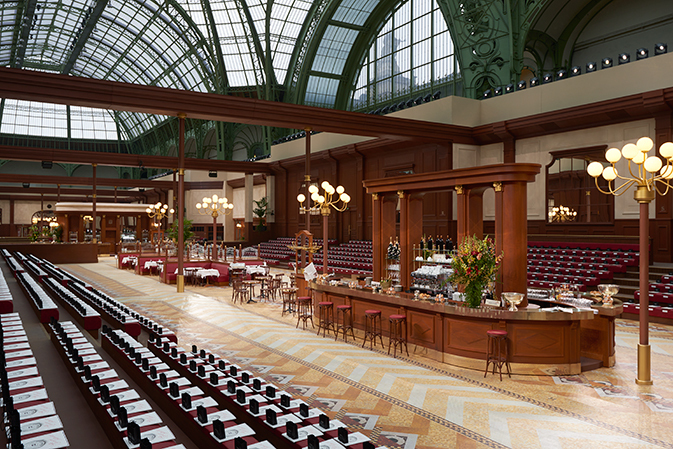 Housed in Paris' Grand Palais des Champs-Élysées, this classic venue was given a temporary face lift to look like the (now iconic) Chanel Shopping Center. After the success of the last F/W collection, I was so excited to watch the 2015/16 show. The video popped up in my YouTube subscription feed, and I was immediately transfixed. Once again, The Grand Palais was transformed into the most elaborate and realistic set that I have ever seen. I've been lucky enough to visit Paris twice already, and by simply watching this show online, I felt as if they cut and pasted a real Brasserie from the centre of Paris right into the middle of the runway. I love the classic, realistic vibe that this show presented, since many fashion shows seem to air more on the side of whimsy. Karl Lagerfeld, Chanel's creative director summed up the F/W show perfectly: "This is a collection about down to earth women." One big OUI from me. Of course, the typical "down to earth woman" wouldn't ever be able to afford a closet full of Chanel clothing, but the whole point of these shows is to identify the trends that speak to you, then apply them to your own personal wardrobe. It's about pulling pieces and trends from the past, modernizing them with new and exciting prints, and feeling great while wearing them. This collection featured bomber jackets, iconic Chanel jackets, leather bags that looked like menus, and the coolest tile-printed fabric. Lots of warm knits and plaid patterns were spotted on this year's F/W runway, paired with laid-back hair and deep dark smoky eyes. It's incredibly inspiring that Karl Lagerfeld can have so much fun with his collections, while still maintaing that classic glam which will always be customary to Chanel. Even though fall fashion is by far my favourite year after year, let's now just look forward to spring.